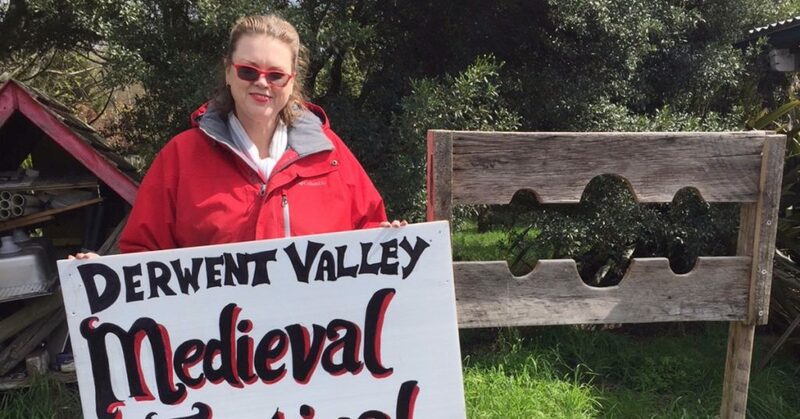 Maree Rieper of Lachlan is one of the passionate volunteers in the Derwent Valley Project Group, the committee behind the Derwent Valley Medieval Festival. In its second year, the 2017 festival (28th and 29th of October) aims to further build on the positive community spirit the first event generated. It’s not just for medieval buffs and enthusiasts. 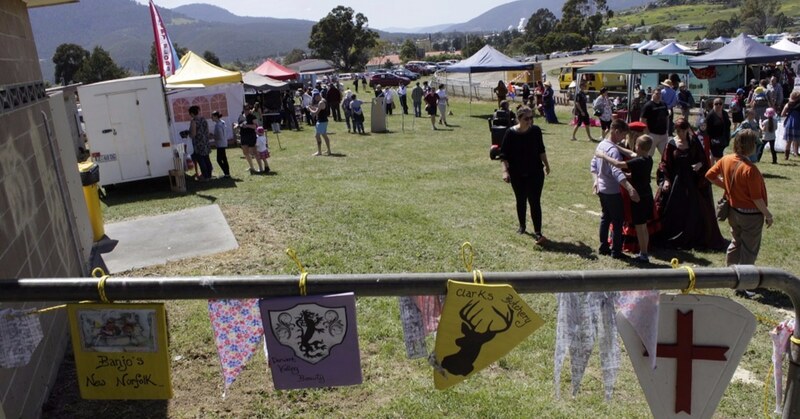 The 2 day festival features local beer, wine, mead and cider makers, food, local businesses, not-for-profit organisations, schools, skill demonstrations, music and entertainment. 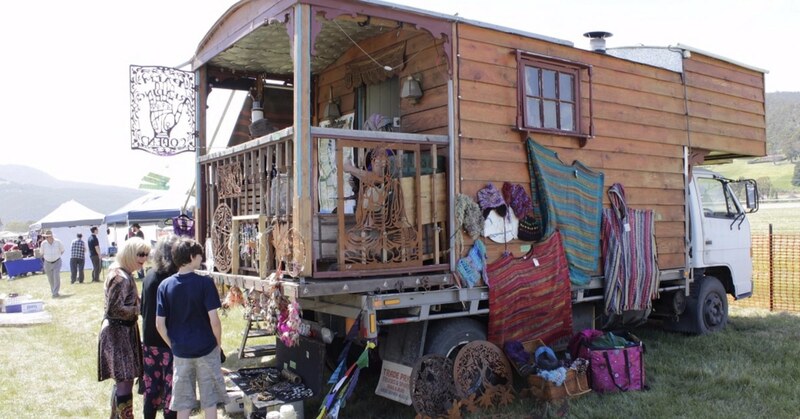 The aim is to create a family-friendly, affordable day out in the township of New Norfolk, free of the commercial and tacky offerings commonly found at many shows. But you also would not be out of place if you chose to come in medieval costume either. It also seems the festival has increasingly taken over her life in the weeks leading up to the big event. Her front porch is filled with props and decorations, from bundles of hand painted bunting to a replica set of stocks and even a faux torture rack. It’s all been made by community members in the spirit of fun. For the organisers, it’s also a lot of work. On the weekend, Maree and other volunteers drive the midland highway putting out promotional road signs, and in the evening Maree assists a seamstress Natasha Woods to create the tunics the Derwent Pony Club will wear in their ‘skill at arms’ and ‘drill games’ demonstrations. 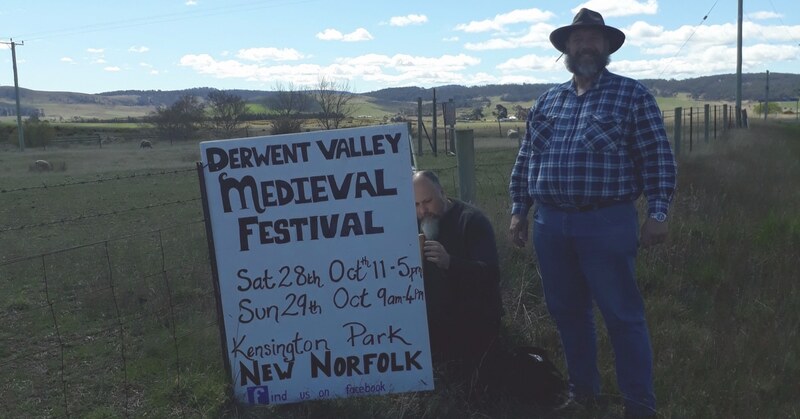 It’s a labour of love that has already made her synonymous in the local community with this relatively new event on the Derwent Valley community calendar. 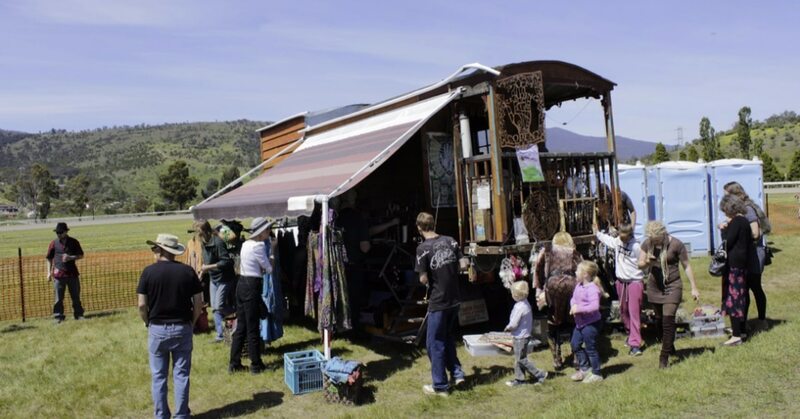 “I pop into town to go to the supermarket or bakery, and every time I have people pulling me aside to talk about the festival, whatever time of year it is.” It’s a sign of the community energy this event has begun to generate. What motivates Maree is knowing that folk from out of town will also come to the festival and experience the best of what her district offer: friendly people, fascinating history, unique arts, great food and beverages…all in a stunning setting. Groups that will come from across Tasmania to participate in the festival include the Van Diemen Fencing Club, Historical European Fighting Club (UTAS) and Ars Militaris (Launceston Vikings).